Recent strength in Gold and gold stocks is mostly due to weakness in the US Dollar which is very oversold and approaching important support. 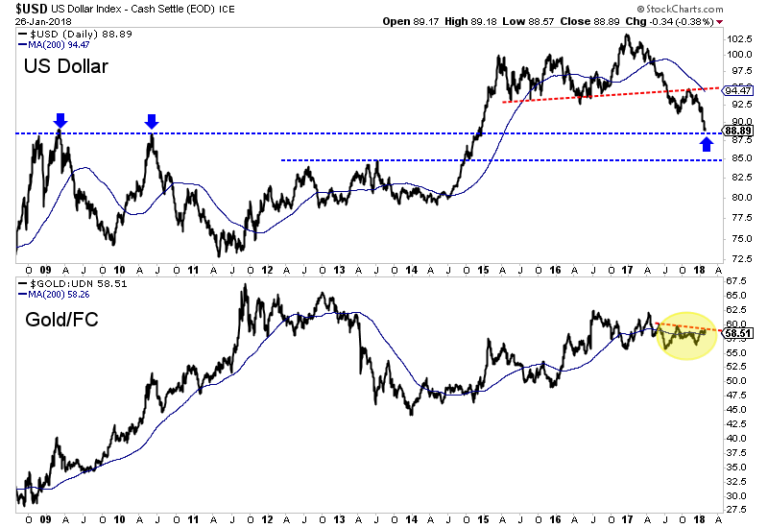 On Friday, the US Dollar Index touched 88, which marks the 2009 and 2010 peaks and is the only real support between the low 80s and the low 90s. We also plot Gold against foreign currencies (Gold/FC) which tells if Gold is rising in real terms or if its rising due to the US Dollar weakness. Gold/FC failed to break above key resistance. That signals that over the short-term, Gold would be vulnerable to a bounce in the US Dollar. Some sentiment indicators suggest the rebound in precious metals could be in its later innings. Thursday the daily sentiment index for Gold hit 91% bulls. Friday, the daily sentiment index for the greenback hit 10% bulls. The CoT’s are not as extreme. Gold’s net speculative position (relative to open interest) is 40% bulls. The 2011, 2012 and 2016 peaks were around 55% bulls. Meanwhile, Silver’s net speculative position is at 26% bulls. Gold and gold stocks have enjoyed a great rebound since the Fed rate hike but technicals and sentiment suggest they are due for a pause or correction. 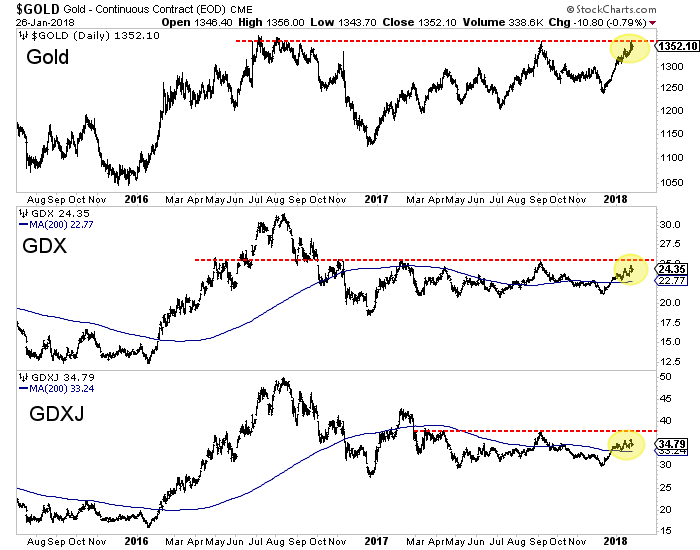 The miners and Gold are very close to the resistance levels we noted in a recent editorial. Recent strength has been driven mostly by weakness in the US Dollar which is very oversold and testing support. Meanwhile, the daily sentiment index has reached short-term extremes for Gold and the greenback. The odds appear to favor a pause in this rebound or a short-term correction. That is great news for anyone who missed the rally as it would setup a decent buying opportunity before a major breakout. We continue to seek the juniors that are trading at reasonable values but have fundamental and technical catalysts that will drive increased buying. To follow our guidance and learn our favorite juniors for 2018, consider learning more about our premium service.